Can one of the most popular games of chances be outsmarted and turned to your favor? How big of an impact does your luck really have, and can you increase your chances of winning? Read along to find out! How Many Cards Is Too Much? Bingo is a lottery game that first emerged in the 16th century, in Italy. From there on, it spread widely through Europe, eventually hitting North America as well. Over there, it became one of the most played games of chance. In the US today, it is used primarily by churches and charity organizations in order to collect funds for those in need. Later on, they were introduced as a part of the firsts casinos in Nevada, and they spread to many others not too long after that. Bingo games are quite easy to understand. They can be played in special Bingo rooms or even better, in the comfort of your own home — Whichever you prefer. 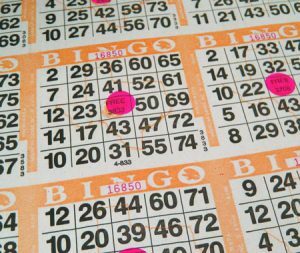 Bingo is played on a special scorecard that contains 25 randomly chosen numbers. Additionally, there is the word ‘Bingo’ written on top of the numbers. That is not just the indicator of the game you are playing. Namely, every letter of the word corresponds with a row of numbers, so when they are drawn, they create a combination (for example, B7). To win, you will need to cover 5 of them in a horizontal, vertical or diagonal row. Pretty simple, isn’t it? Additionally, there is a caller — The person who draws and calls the balls with numbers on them. The caller can also play Bingo at the same time. However, if you are playing in Bingo halls, there will be a professional caller assigned. When playing online Bingo, having a caller is one more thing you won’t have to worry about. Before you begin, you will also have to give chips to each player. The chips are used to cover the numbers that are called on your scorecards. Instead of chips, you can always use any other small object, such as coins or pieces of paper. Also, you will have to put one chip at the center. It is considered free space, and every player should have it on their scorecard. Speaking of scorecards, you can either play using only one or a couple — There is no limit. The only limitation is how well you can keep track of them. Naturally, having more than one scorecard can increase your odds of winning. The number of cards, however, does not guarantee you a sure win. This is the case with most games of chance. And lastly, you will need to secure a bowl or a bucket in which you can put Bingo balls for the caller to draw out. In Bingo halls, there are special Bingo spinners provided for that purpose. Through these spinners, you can clearly see the numbers turning. When you collect 5 numbers in a row, don’t forget to shout ’Bingo!’ at the top of your lungs in so the caller knows they need to stop drawing numbers! In Bingo, there are some basic tips you can follow to try and increase your chances. There are also a couple of advanced Bingo strategies to master. We will cover both in this article. Before covering some of the more complex strategies, let’s list some of the basic suggestions you can try first. It is important that you get familiarised with the game and the environment you will be playing in. Basically, you should try getting there a little earlier in order to purchase your scorecards, get yourself a drink, and relax before the game begins. One thing that could come in hand is a Bingo dabber — A small marker that helps you indicate the odd and even numbers the caller draws. This will help you keep the track more easily. Choosing your seat is more important than you might think when playing Bingo. Bingo players know the best how important it is to be away from any distractions, especially if you want to hear the caller better. That’s why we advise you to sit as close as possible to those players— That’s how you won’t miss out on anything. Additionally, to keep your concentration on the highest possible level, you shouldn’t play when you are tired or agitated — Not to mention if you consumed too much alcohol. This is just to ensure that you don’t miss out on any numbers the caller draws. Also, Bingo becomes very exciting quite fast, so you will feel a rush from the game early on. Before you choose to try out your luck with Bingo, you can always visit an online casino or one of the many Bingo sites that offer you to play in the fun mode. That way, you can get accustomed to the game with no strings attached, and even try again with some free spins. Do not forget that in Bingo, like in many other games, there can only be one winner. Keeping that in mind, you should try to find a Bingo hall with fewer players, thus increasing your odds. This game has a particularly low attendance on weeknights. However, do not forget that fewer players also means a smaller prize! One of the surest ways to increase your Bingo odds is to have a bigger number of cards in play. That way, you have more options in hitting that sweet 5-in-a-row victory. However, as things get heated, which often happens when playing this game, you can quickly lose track of your cards and end up with nothing. So before you master multitasking with your scorecards, you can always try playing with only two or three cards for a couple of games. By doing so, you will stay in the game longer — And by staying longer, your odds of winning can only increase. After you master the basics, you can try implementing some of the more demanding strategies in your game. You never know what works the best for you, so read ahead! One of the best-known Bingo strategies is the one created by Joseph E. Granville. He was a financial writer, famous in the US for his advice on how to invest wisely into the stock market. This principle of his, known as OBV (On Balance Volume), is one of the most successful tips for market investors to this day. having closely the same amount of numbers ending with anything from 0 to 9. Unfortunately, this option of switching and choosing cards is limited when playing in an online casino, so keep that in mind. Although there are some that will allow you this option. Tippett was a well known British statistician who claimed that cards with more median numbers have a higher chance of containing the winning combination. Namely, he tried to prove that the longer you play, the more numbers will gravitate towards the Median. That way, you should choose numbers closer to 1 or 75 when playing shorter games, and numbers close to 35 when playing longer. Bingo is one of the funniest games of chance out there. It has a long-standing tradition of making the players excited and joyful, with a unique approach to luck and good fortune. Bingo can be played with friends and family, as well as with skilful players in the casino — Whatever you prefer. Just like any other game of luck, it can never be fully mastered to your advantage, but there are some ways to get closer to the winning strike. By following the basic rules of statistics and probability, you can significantly increase your chances. Next Next post: Bingo! Alex Just Won $7,777 and He Cannot Keep Calm!